The Basilican Church of Saint Peter, erected by the emperor Constantine c.330, was pulled down to make way for the present cathedral. The Basilican Church of Saint Peter was erected by the emperor Constantine c.330 over the tomb of Saint Peter, which was also near Saint Peter's site of martyrdom in the Circus of Caligula and Nero. It is one of the largest imperial buildings constructed in Rome during the late years of the Empire. As such, its plan should be represented within the Ichnographia Campus Martius, however, it is not. 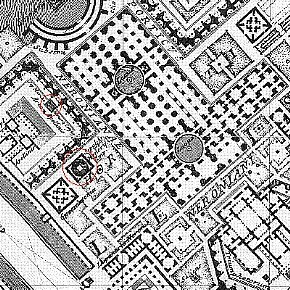 Instead Piranesi fills the Vatican Valley with the elaborate Garden of Nero whose placement here is archeologically correct, although Piranesi's plan of the garden is entirely his own. Hence, it is easy to surmise that Piranesi simply chose to "reconstruct" this portion of ancient Rome according to its first century condition, and such a theory is plausible except that Piranesi also chose to include the Tomb of Honorius within the Garden of Nero, a sizable structure that was actually attached to Saint Peter's Basilica. The omission of Christianity's foremost shrine from the large plan therefore heralds ambiguity. St. Peter's was founded by Constantine primarily as a covered cemetery and funerary hall, serving mainly for burials, commemorative banquets, and the veneration of a martyr, the Apostle Saint Peter. Its floor was covered with graves; funerary banquets were customary--Saint Augustine tells of them as late as about A.D. 400; mausolea crowded around its walls, one--S. Maria della Febbre--older than the church and surviving until the eighteenth century. St. Peter's was on an imperial estate out of town: on the shoulder of the Vatican Hill where it sloped down toward the Gardens of Nero. [The basilica] was placed on a large terrace created by filling in the pagan necropolis and the small Christian cult center therein; only the upper part of the niche, Saint Peter's memorial, remained above the floor level. Richard Krautheimer, Rome: Profile of a City, 312-1308 (Princeton: Princton University Press, 1980), pp. 26-7. 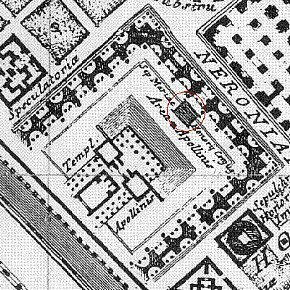 A detail area of the Horti Neroniani with the Circus of Caligula and Nero (left) and the Porticus Neronianae (right) is superimposed with the coinciding portion of Nolli Plan of Rome. Finding the location within the Ichnographia of where the Basilica of Saint Peter's should be, begins to disclose Piranesi's intent. For example, in actuality the altar of St. Peter's Basilica sits directly above Saint Peter's tomb, which is part of row of tombs, and a superimposition of the basilica's plan and the Ichnographia plainly indicates that Piranesi places a row sepulchers precisely where they ought to be. Furthermore, the basilican plan of the Porticus Neronianae is certainly a reference to the Basilica of Saint Peter's, albeit inverted. It is as if Piranesi located St. Peter's Basilica within the Ichnographia without actually delineating it. This illusory mode of operation, moreover, infuses double meaning into the buildings of the Horti Neroniani that Piranesi does draw. 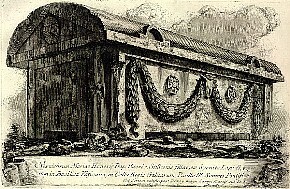 It therefore becomes evident that Piranesi's rendition of the Porticus Neronianae is an imaginative reminder that not only did Saint Peter suffer and die under Nero's persecution of the Christians, but that in the end it is Saint Peter, through Christ, that ultimately triumphs. There is thus no doubt that Piranesi clearly recognized the tremendous irony whereby the most hedonistic of imperial Roman gardens ultimately became Christianity's terrestrial and spiritual center.